Bonide Wasp and Hornet Killer kills on contact from 20 feet away! 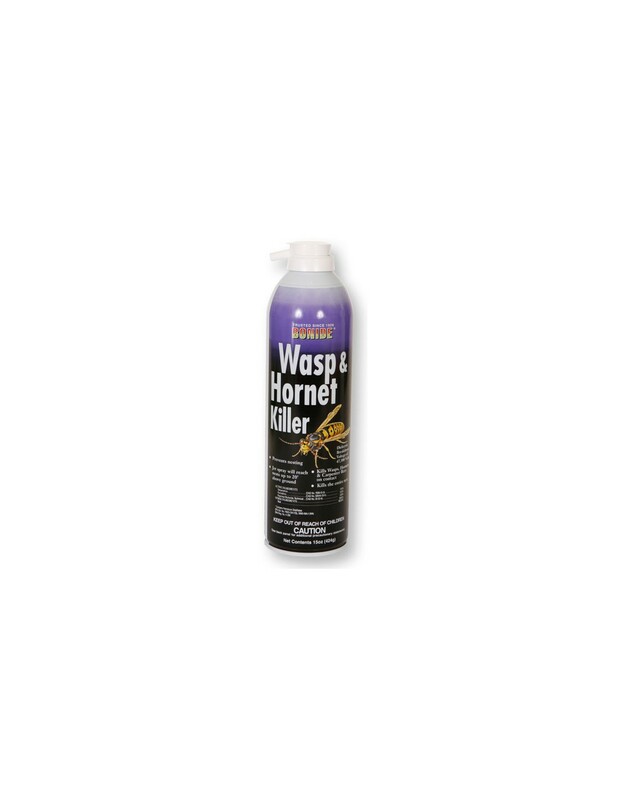 Specially formulated to provide instant knockdown of wasps and hornets. For best results, spray in early morning or late evening when insect activity is minimal. Take your control back over these stinging pests by arming yourself with Bonide Wasp and Hornet Killer. Bonide Wasp and Hornet Killer kills on contact from 20 feet away! Specially formulated to provide instant knockdown of wasps and hornets. For best results, spray in early morning or late evening when insect activity is minimal. Stand a safe distance from nest and not directly underneath. Remove protective cap, hold can upright and point spray opening toward nest with wind at your back. Spray until nest is thoroughly saturated to kill the entire nest population. Residual action will kill wasps and hornets returning to the nest. Wait at least 24 hours before removing the nest. Take your control back over these stinging pests by arming yourself with Bonide Wasp and Hornet Killer. WASPS AND HORNETS: Hold container in upright position to treat. Stand safe distance, 6 - 15 feet from nest and not directly underneath. Align actuator opening with the mark on valve cup. Aim actuator opening toward nest. Treat nest until thoroughly wet. Wasps and hornets on nest should be contacted with spray when possible. Best time of day to treat is in evening or early morning, since wasps and hornets congregate on or in nest at night. Do not apply to pets or contaminate food, foodstuffs, dishes or utensils. For outdoor use only. To prevent dying insects from falling on skin and clothing, avoid standing directly under nest being treated. YELLOW JACKETS AND BEES: Locate underground nest. Align actuator opening directly opposite the mark on valve cup. Depress actuator and treat, with a sweeping motion, any stimulated or stirred-up insects around nest opening. Afterwards, move forward to nest opening and apply liquid for 6 - 8 seconds directly into nest hole. This will suffocate bees and yellow jackets in nest; other bees and yellow jackets trying to return to nest will be repelled and will fly around and away harmlessly. SPIDERS, INCLUDING BLACK WIDOW AND BROWN RECLUSE: Apply spray directly onto spiders and web. 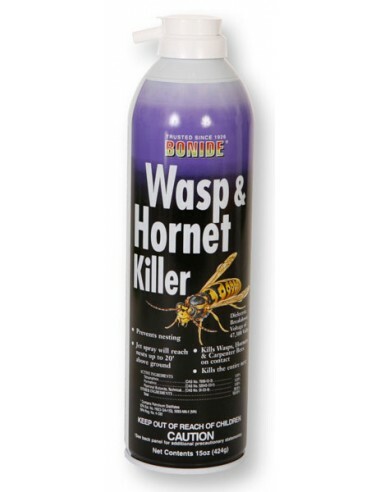 Bonide Wasp and Hornet Killer Manufacturer: Bonide Products Inc.